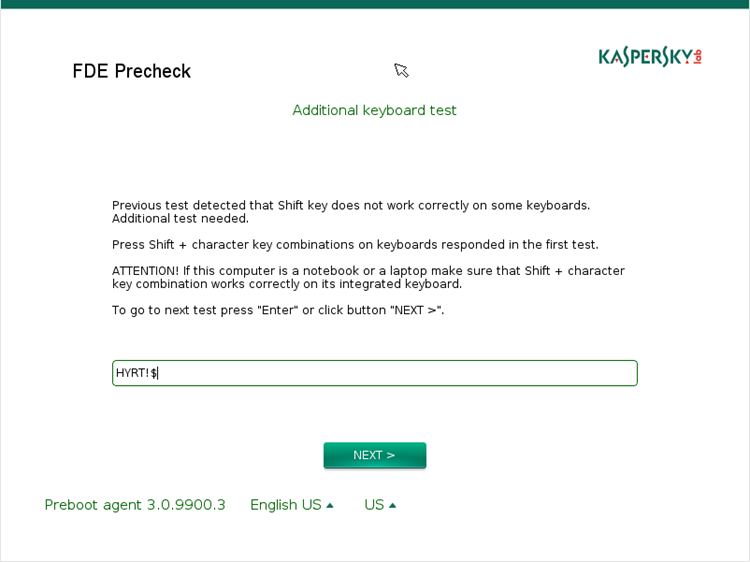 FDE Test Utility can’t be run on computers where Kaspersky Endpoint Security is installed with the AES Encryption Module. Administrative privileges are required for running the utility. For Kaspersky Endpoint Security 10 Service Pack 2 Maintenance Release 3 for Windows. 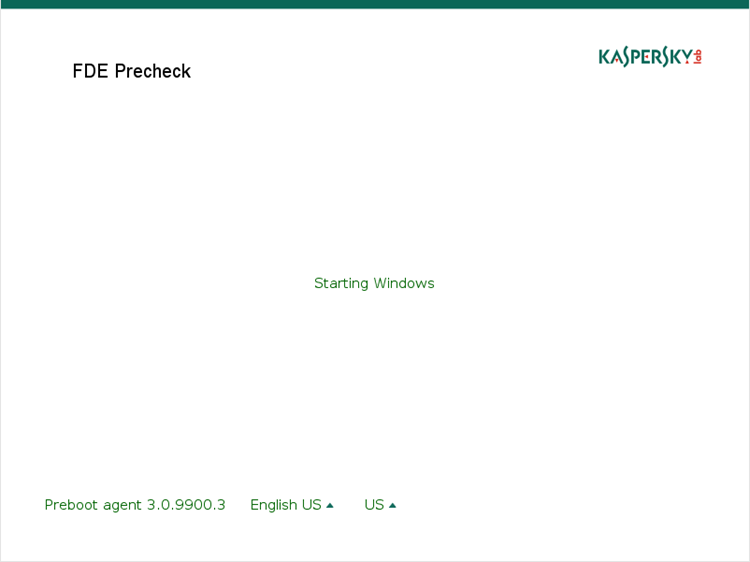 For Kaspersky Endpoint Security 10 Service Pack 2 for Windows. For Kaspersky Endpoint Security 10 Service Pack 1 Maintenance Release 4 for Windows. For Kaspersky Endpoint Security 10 Service Pack 1 Maintenance Release 3 for Windows. For Kaspersky Endpoint Security 10 Service Pack 1 Maintenance Release 2 for Windows. Copy the archive with the utility to the local drive and extract the files. Run fde_precheck.exe as an administrator. FDE Test Utility will run simple compatibility tests. If the tests find some fatal incompatibilities, FDE Test Utility will exit. The test results will be saved to fde_precheck_report.txt. 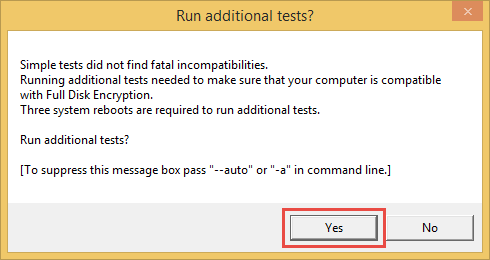 If simple tests do not find any fatal incompatibilities, FDE Test Utility will ask you whether to run additional tests. FDE Test Utility will run the installation of the components necessary for performing an additional set of compatibility tests. Upon completing the additional tests, the utility will automatically remove all installed components. In order to perform the additional tests, three automatic computer restarts are required. Before clicking Yes, save all data. 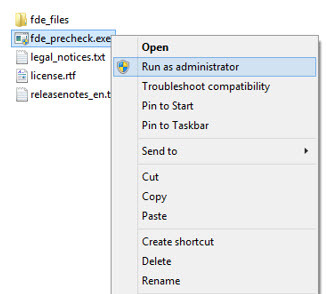 If the tool detects any incompatibilities at this step, it will remove all installed drivers and write the results to the file fde_precheck_report.txt. If no compatibility issues are detected, the tool will install the preboot agent once again and will perform the second computer restart. After the second reboot, the utility will run the preboot agent before the operating system is loaded. It will perform several interactive tests to check compatibility with input devices (keyboard, mouse, etc.) and the abiility to authenticate with tokens and smart cards. After running preboot tests, the utility will run automatically in background mode. It will collect the results of preboot tests and initiate deletion of all its installed drivers and the preboot agent, and will reboot the computer for the third time. After the third reboot, the tool will save the results of its checks to the fde_precheck_report.txt file. All drivers installed by the tool as well as the preboot agent will be removed from the system. 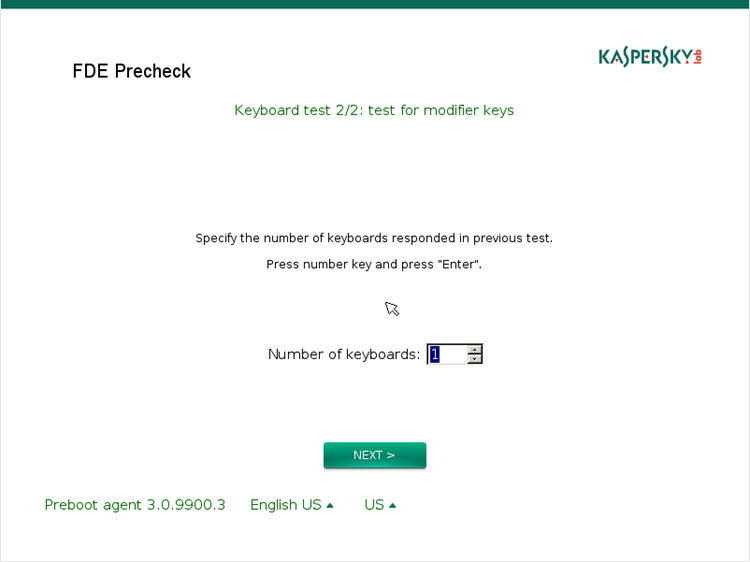 FDE Test Utility performs interactive tests for compatibility with keyboards, pointing devices (mice, touchpads, touchscreens), and tokens. 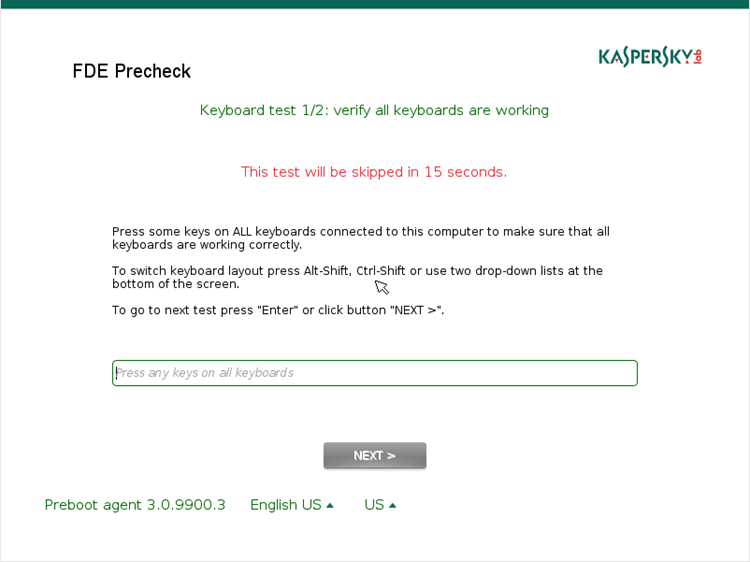 This is a basic test that ensures that all keyboards connected to your computer function properly in preboot agent. This test’s timeout is 120 seconds. If the preboot agent cannot detect a key press within this time interval, it will skip the test and proceed to the Pointer devices test. The test checks the modifier keys (Shift, Alt, Ctrl) on all connected keyboards. This test runs if the Shift key was not detected in the previous test. 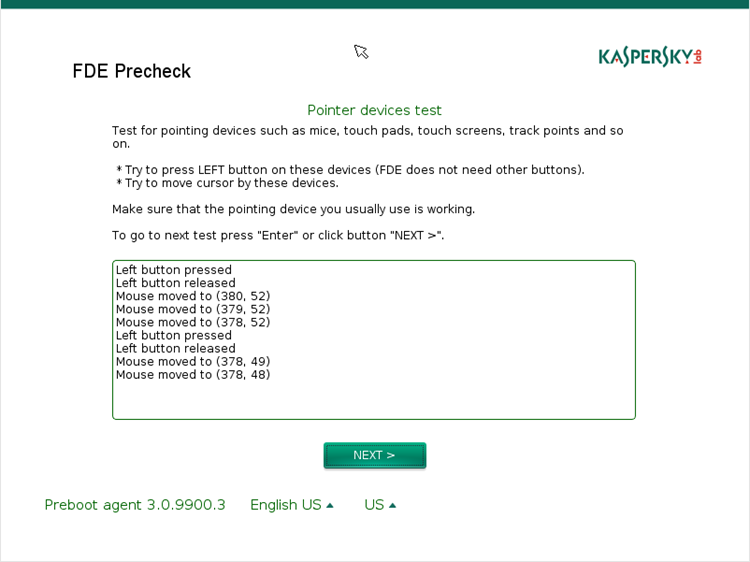 This test is for checking the compatibility of the preboot agent with computer mice, touchpads, and touchscreens. This test checks authentication tokens for compatibility with the preboot agent. This is the final test. Preboot Agent starts Windows after it is complete. The first line contains the computer name, Windows version and type of architecture. Information about any incompatibility issues found and the list of tokens tested. 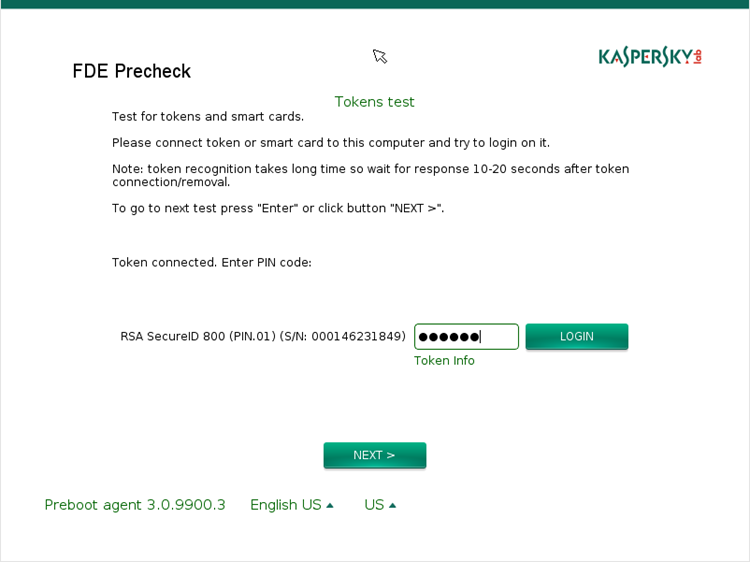 The last line contains the main test result, which establishes whether or not your computer is compatible with the Full Disk Encryption feature of Kaspersky Endpoint Security 10. Completed tests found no problems. This computer can be encrypted with Full disk encryption. Modifier key Shift on keyboard 1 does not work in FDE Preboot agent. 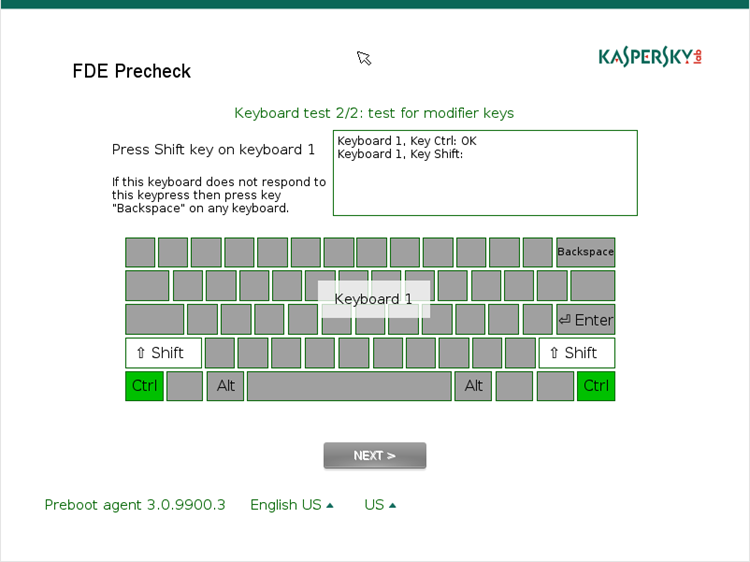 User will not be able to switch input language and keyboard layout in FDE Preboot Agent with keyboard shortcuts. Try to use other keyboard. Try to use keyboard with other connector type (USB or PS/2). Try to install Windows with other boot method (Legacy BIOS or UEFI). Some not critical incompatibilities found. You can fix all of them. This computer can be encrypted with Full disk encryption.